How do I see my data on a map? Using Fulcrum's map view for displaying and reviewing data. 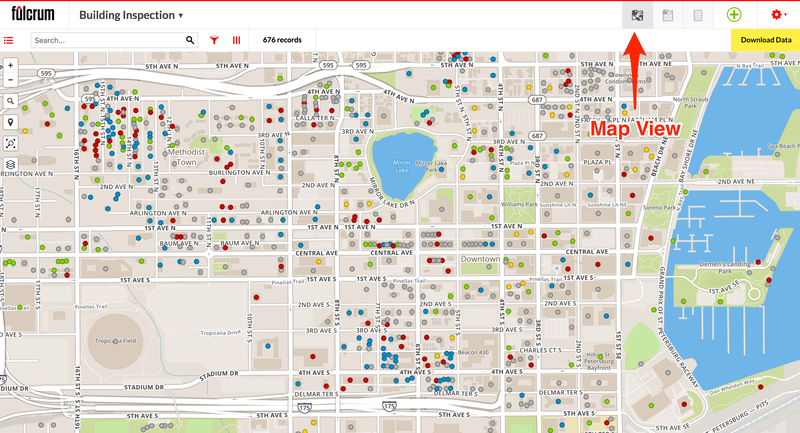 Fulcrum’s web app record editor has a view for visually displaying your data on a map. This view is ideal if you wish to visually see where your records are located on a map. Through an app’s dashboard view, you can access the data view page by selecting View Data. You can also get to the data view page by clicking one of the Records buttons next to your apps from the homepage. Once you are in the record editor the data is displayed on the map view by default. If the view is changed you can always get back to the map view by clicking on the map icon from the data view selector.